Get a $50 cash back rebate from ESAB® PLUS a FREE 2 lb spool of flux-cored wire ($19.93 MSRP value) with purchase. Expires 6/30/19 ESAB® Rebel™ EM 215ic is a complete 240 amp MIG welding package. It features sMIG technology that actually adapts the MIG arc characteristics to your unique welding style. Get a $50 cash back rebate from ESAB® PLUS a FREE Optrel p550 auto-dark welding helmet PLUS 2 lb spool of flux-cored wire ($255 MSRP value) with purchase. Expires 6/30/19 ESAB® Rebel™ EMP 215ic is a complete 240 amp MIG, DC TIG, and Stick welding package. Get a $50 cash back rebate from ESAB® with purchase. Expires 6/30/19 ESAB® Rebel™ EM 235ic is a 250 amp MIG welder that operates off of standard household 120 volt OR 230 volt input power and can weld up to 1/2 inch plate. Get a $50 cash back rebate from ESAB® PLUS get a FREE Optrel® p550 auto-dark welding helmet AND FREE 2 lb spool of flux-cored wire ($255 MSRP Value) with purchase. Expires 6/30/19 ESAB® Rebel™ EM 235ic with cart is a 250 amp MIG welder that operates off of standard household 120 volt OR 230 volt input power and can weld up to 1/2 inch plate. Get a $100 cash back rebate from ESAB® PLUS get a FREE Optrel™ p550 auto-dark welding helmet AND FREE 2 lb spool of flux-cored wire ($255 MSRP Value) with purchase. Expires 6/30/19 ESAB® Rebel™ EMP 235ic is a 250 amp MIG, DC TIG, and Stick welder that can weld up to 1/2 inch plate. It operates off of standard household 120 volt OR 230 volt input power. Get a $100 cash back rebate from ESAB® PLUS get a FREE Optrel™ p550 auto-dark welding helmet AND FREE 2 lb spool of flux-cored wire ($255 MSRP Value) with purchase. Expires 6/30/19 ESAB® Rebel™ EMP 235ic with cart is a 250 amp MIG, DC TIG, and Stick welder that can weld up to 1/2 inch plate. Get a $100 cash back rebate from ESAB® PLUS get a FREE Optrel™ p550 auto-dark welding helmet ($234.52 MSRP Value) with purchase. Expires 6/30/19 ESAB® Rebel™ EMP 285ic is a 300 amp MIG, DC TIG, and Stick welder that can run up to 1/16 diameter welding wire. Get a $100 cash back rebate from ESAB® with purchase. Expires 6/30/19 ESAB® Rebel™ EMP 285ic with cart is a 300 amp MIG, DC TIG, and Stick welder that can run up to 1/16 diameter welding wire. Get a $100 cash back rebate from ESAB® PLUS get a FREE Optrel™ p550 auto-dark welding helmet ($234.52 MSRP Value) with purchase. Expires 6/30/19 ESAB® Rebel™ EMP 285ic 3 Phase is a 350 amp MIG, DC TIG, and Stick welder that can run up to 1/16 diameter welding wire. Get a $100 cash back rebate from ESAB® with purchase. Expires 6/30/19 ESAB® Rebel™ EMP 285ic 3 phase with cart is a 300 amp MIG, DC TIG, and Stick welder that can run up to 1/16 diameter welding wire. Get a $75 cash back rebate from ESAB® with purchase. Expires 6/30/19 Thermal Dynamics® Cutmaster® 58 plasma cutter with 20 foot torch provides 60 amps of output for outstanding cuts on 1/2 inch steel. Get a $75 cash back rebate from ESAB® with purchase. Expires 6/30/19 Thermal Dynamics® Cutmaster® 58 plasma cutter with 50 foot torch provides 60 amps of output for outstanding cuts on 1/2 inch steel. Get a $100 cash back rebate from ESAB® PLUS get a FREE 2 stage plasma air filter ($246 MSRP value) with purchase. Expires 6/30/19 Thermal Dynamics® Cutmaster® 60i plasma cutter with 20 foot torch features 60 amps of cutting output with a recommended cut capacity of 5/8" and maximum sever capacity of 1 1/2". Get a $100 cash back rebate from ESAB® PLUS get a FREE 2 stage plasma air filter ($246 MSRP value) with purchase. Expires 6/30/19 Thermal Dynamics® Cutmaster® 60i 3 Phase plasma cutter with 20 foot torch operates on smooth, stable and highly efficient 3 phase input power. Get a $100 cash back rebate from ESAB® PLUS get a FREE 2 stage plasma air filter ($246 MSRP value) with purchase. Expires 6/30/19 Thermal Dynamics® Cutmaster® 60i plasma cutter with 50 foot torch features 60 amps of cutting output with a recommended cut capacity of 5/8" and maximum sever capacity of 1 1/2". Get a $100 cash back rebate from ESAB® PLUS get a FREE 2 stage plasma air filter ($246 MSRP value) with purchase. Expires 6/30/19 Thermal Dynamics® Cutmaster® 60i 3 Phase plasma cutter with 50 foot torch operates on smooth, stable and highly efficient 3 phase input power. Get up to a $100 cash rebate orFREE welding accessories from ESAB® when you purchase select welders or plasma cutters. 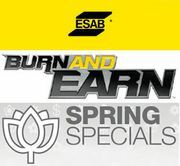 ESAB Burn And Earn™ Spring Specials Program features the Rebel™ EMP 215ic & EM 215ic, Rebel™ EM 235ic, Rebel™ EMP 235ic and Rebel™ EMP 285ic multi-process welders, and Thermal Dynamics® Cutmaster® 60i & Cutmaster® 58 plasma cutters. Download Burn And Earn™ Rebate Submission Instructions HERE. All rebate forms MUST be submitted electronically to ESAB no later than July 15, 2019. Offer expires 6/30/19.